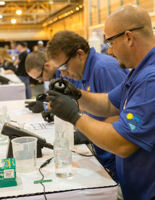 For the first time in many years, the Nevada Water Environment Association sent a team to compete last year at WEFTEC® 2013. Each member of that team went home and started his or her own Operations Challenge team. Brian Carlson went home to the City of Henderson, Nev., and formed the Dumplings. As a member of the Water Environment Federation (Alexandria, Va.) since 2006 who has worked for Maryland Environmental Service (Millersville) for 26 years, Ellen Frketic has known about Operations Challenge for years. Her organization has more than 100 operators, and she kept thinking “we should be doing this,” Frketic said. Troy Newton, coach of the Water Environment Association of South Carolina team Controlled Chaos, remembers watching other employees at his facility practicing for Operations Challenge. Newton thought it looked fun and joined the team in 1995. When Newton’s organization, the Charleston (S.C.) Water System formed a team in 2014 with all new competitors, Newton stepped in as coach for the first time. “[It’s] my first time as a coach, and their first time at nationals,” Newton said. Laurie Perkins, coordinator for the Collection Systems Event at WEFTEC® 2014, is one of many volunteers working hard behind-the-scenes to make sure the competition runs smoothly. WEF Highlights featured the articles above and the November article, “Central States Volunteer Helps Operations Challenge Team Win First in Division 2 Laboratory Event,” as part of a series offering unique perspectives of Operations Challenge. Leading minds from across the globe convened in Kathmandu, Nepal, Oct. 26–30, to attend the International Water Association (London) Specialist Conference on Global Challenges for Sustainable Wastewater Treatment and Resource Recovery. The conference provided a unique opportunity for the Water Environment Federation (Alexandria, Va.) to strengthen its partnership with IWA in the areas of wastewater treatment and resource recovery from a utility or practitioner’s perspective. A little more than a year ago, I was asked to chair the Water Environment Federation (WEF; Alexandria, Va.) Operator Strategy workgroup. I was honored because operators are a key element in protecting public health and the environment, and I want to do whatever’s necessary to ensure we have the best trained people working in these positions.